OK. I started this whole adipocyte thread because I was interested in the longevity effect in the GHrKO mouse, the Laron mouse. These posts get written because I am compelled to, I have no choice in it. I never know where they are going to end up as they start. This one has involved a lot of looking at the various types of adipocytes and how they function in normal physiology and what happened when transplanted to more unusual places. Much of it makes sense, and it does put a very different perspective on the roles of visceral and subcutaneous adipose tissue. What I was looking for was what might be special about Laron dwarf mouse derived adipocytes. You can't quite find all of the answers you want to because not all of the questions have really been asked directly, but I think you can get close. 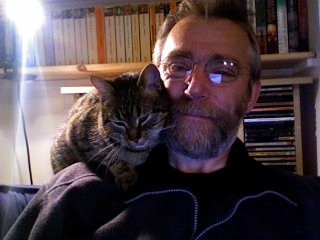 I think this is going to be the last post in the series, a relief to me, and possibly to readers too. Laron mice (GHrKO) are the longest lifespan mice ever engineered by humans. They are dwarf and obese and the obesity tends to be central. They have exquisitely low blood insulin levels and it is thought that the reduced signalling through the GH/IGF-1/insulin system is responsible for their longevity. Adding GHrKO adipocytes to the abdomen of normal mice improves their glucose tolerance significantly. The GHrKO adipocytes are clearly a bit more effective than the normal eWAT adipocytes from the last post. Personally, I was surprised at how relatively small the enhancement of the glucose tolerance was, but then there is always that IL-6 to overcome, so perhaps they really are Super Adipocytes. "Surprisingly, FaGHRKOs shared only a few characteristics with global GHR−/− mice. Like the GHR−/− mice, FaGHRKO mice are obese with increased total body fat and increased adipocyte size. However, FaGHRKO mice have increases in all adipose depots with no improvements in measures of glucose homeostasis". My assumption that lack it is the of growth hormone signalling in adipocytes which promotes obesity may not be the whole explanation. It is also true that these FaGHrKO adipocytes, which are possibly very insulin sensitive, are working in a mouse with normal insulin signalling outside of those KO adipocytes. This means that the mice will have normal levels of systemic insulin sensitivity/resistance. Putting calories anywhere other than their special adipocytes will have the potential to induce insulin resistance and any increase in insulin to deal with this will undoubtedly put more triglyceride in to the insulin hyper-sensitive FaGHrKO adipocytes. The second effect in whole body GHrKO mice is that there is essentially no IGF-1 produced either by the liver or as a local tissue hormone in response the "invisible" GH. This is not the case in FaGHrKO mice, their adipocytes may never see GH but they see plenty of IGF-1 which is coming from the perfectly normal GH sensitive liver of the recipient mouse. So is it a lack of IGF-1 signalling which underlies the insulin sensitising effect of GHrKO mice? "Maybe" is the definitive answer and "probably" the more borderline answer... I guess "dunno" still has to rate pretty well too. If you disrupt the IGF-1 receptor of cell lines in tissue culture post-developmentally (using siRNAs) or if you study genetically IGF-1 knockout foetal derived fibroblasts, they all show marked increases in insulin signalling, which is inducible by the siRNAs when these are used. I've stuck the studies down at the end of the post. Note that none of the studies used adipocytes, but the effect appears generic to pretty well all cell lines tested. There is just one paper which suggests that setting up a near-complete cessation of IGF-1 exposure, with normal IGF-1 receptor genes still present, at around 10 days of age (mice again) has a long term effect to enhance insulin receptor gene expression. To emphasise: these mice have the IGF-1 receptor gene (so they should be making IGF-1 receptors), just minimal IGF-1 exposure, rather like the Laron mice. Inducing this state very early in life appears to be key for sensitising to insulin signalling. "Within 3 months of a loss of IGF-1, there was a 2.2-fold increase in insulin receptor expression within the vertebral bones of our female mice, suggesting that local signaling may compensate for the loss of circulating IGF-1". The ad hoc hypothesis in this last paper is that insulin signalling increases to meet metabolic needs, despite there still being IFG-1 receptors present to potentially interfere with insulin receptor function. This is the suggestion that makes me think that total loss of IGF-1 signalling, with genetically preserved IGF-1 receptor genes (but which no longer get expressed), might underlie the Laron GHrKO mouse insulin sensitivity effect. It's not just in adipose tissue, it's whole body. Everything becomes insulin sensitive and the level of insulin needed to maintain normoglycaemia plummets. Low insulin signalling = long life. You then have to ask why this might happen if we are looking for a metabolic effect in excess of insulin receptor function modification. IGF-1, in addition to it's anabolic role, also facilitates glucose ingress, much as insulin does. We know that this is the case from a number of studies including those involving humans with defective insulin receptors (Donohue Syndrome or Leprechaunism) or in severe lipodystrophy (such as Berardeinelli-Seip Syndrome) where IGF-1 facilitates glucose uptake clinically. This would allow tonic insulin-independent uptake of glucose to generate NADH for activation of the glycerophosphate shuttle (mtG3Pdh) and set bias for reducing the CoQ couple. Overlaid above this we have genuine insulin signalling, used to facilitate closely controlled caloric ingress and glycolytic NADH generation for CoQ couple reduction. Only small amounts of insulin would be needed in excess of IGF-1 delivered glucose to allow enough extra ingress to instigate insulin signalling. 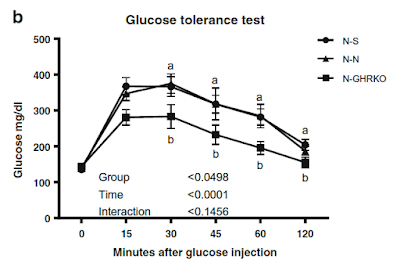 Under caloric excess smaller than anticipated amounts of insulin would be need to induce insulin resistance promptly because there is the background IGF-1 facilitated glucose ingress. Without the tonic IGF-1 facilitated glucose supply all glucose would have to come via insulin signalling. Insulin would find each cell calorically "emptier" of glucose than it would be had IGF-1 been signalling. With an enhanced extracellular to intracellular glucose gradient more glucose should enter the cell per GLUT4 translocated. In the post prandial state all glucose entry would be via insulin alone. There would be much less need to activate insulin-induced insulin resistance, or at least it would be significantly delayed, in the process of controlling caloric ingress. Much of the time insulin could be allowed to signal and that signalling would still merely supply cellular needs without needing to induce any insulin resistance for negative feedback. You could describe the whole body lack of an IGF-1 background glucose supply as making all cells chronically "hungry", so improving both insulin signalling and glucose ingress per unit insulin signalling enacted. This apparent chronic hunger due to lack of IGF-1 signalling might be where the longevity effect come from and might be why genuine caloric restriction of GHrKO mice does not add to their already considerable lifespan. That's how it looks to me. I'd sort of hoped that would be it for this thread but certain adipocyte transplant studies keep niggling at the back of my mind. I'm trying to ignore them. "We used small interfering RNA (siRNA) to specifically target down- regulation of IGF1R and found that IGF1R was efficiently suppressed without affecting IR expression. However, IGF1R down-regulation by siRNA sensitized cells to insulin. Our results suggest that specific targeting of IGF1R alone enhances insulin signaling, which may be an undesirable effect in breast cancer cells". "A striking observation from our studies was the increase in insulin responsivity in osteoblasts following deletion of the IGF-1R". "The insulin receptor (IR) pathway in IGF-IR null MEFs was hypersensitive to insulin ligand stimulation resulting in greater AKT phosphorylation than in wt or het MEFs stimulated with the same ligand". "In IGFRKO cells, insulin-induced phosphorylation of IRS-1 was enhanced, suggesting that IGFR may actually inhibit IR signaling to some extent". I have been enjoying this whole series re: adipocytes inflammation and insulin resistance, and your unique insights. That visceral fat is exquisitely insulin sensitive and primarily a passive marker for chronic hyperinsulinism (vs pro-inflammatory cause of IR) is not something I had considered. One reason the improvement in IS was only modest in normal mice receiving ghrko adipocytes is, as we know from fat transfers of humans (done for cosmetic surgery) often times the adipocytes just don't survive. This is why if a prospective pt is interested in elective cosmetic surgery to transfer unsightly abdomen fat to say, backside, you actually need to gain weight or be quite heavy before a surgeon considers doing this. Of the fat that is harvested, and implanted, not all of it will survive the transfer, much of it dies or is reabsorbed by the body; it must latch on to a good blood supply to take root and function. I imagine a similar thing occurs in rodents, so probably not a great deal of these GH resistant lipoysis resistant adipocytes are even surviving the procedure. In light of that knowledge, I consider the IS improvement very impressive. I suspect the success of adipocyte transfer when dealing with two different animals (vs the same organism) is probably even lower. GH has a big role in stimulating hyperglycemia, life long lack of input GH on the liver for this process may improve insulin sensitivity through less endogenous glucose production. GH signalling also affect muscle metabolic processes apart from IGF-1, although I don't doubt attenuated IGF-1 contributes to super insulin sensitivity of GHKO rodents as you hypothesize. We're going to have to hire a fact checker just to keep up with these posts. alt, probably find I make it up as I go along. But no, some of the findings are too weird to make up. How I enjoyed this series! Fantastic, very insightful. Just one question: why are Laron mice obese? Sorry if it's obvious to everyone else! Two answers really, their adipocytes are exquisitely insulin sensitive. Like omega 6 FFA ingestion but more so. Insulin sensitive adipocytes store fat. That's their job. I think the trigger for this sensitivity is a total lack of IGF-1 action. Second, there is no GH inducing lipolysis, so they lack one component to shrink their adipocytes. This also leads to obesity. I also suspect the ILGF-1 absence may be crucial to avoiding insulin-induced insulin resistance, whole body, as well as the effect being crucial in adipocytes. The Laron mouse are long-lived and metabolically fit but has terrible body composition, exactly the opposite of what you observe in free-living humans. Could it be as simple as, by hook or by crook, as long as your adipose tissue is buffering you against energy surges you'll live long?